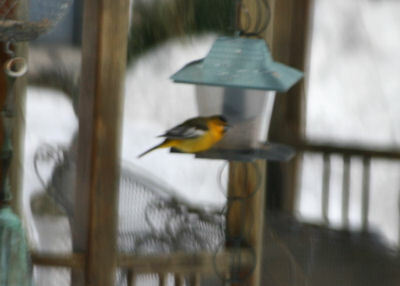 About two weeks ago word went out on the New York listservs that a Bullock’s Oriole was frequenting feeders on Tremper Road in the tiny town of Phoenicia, NY, a mere twenty-five minutes from my hometown. Bullock’s Oriole is the western version of the Baltimore Oriole and the two are so similar that they were briefly lumped together as a single, unimaginatively-named species, the Northern Oriole. Because I was planning on visiting my grandmother and parents yesterday anyway I figured I might as well drive the extra distance to see such a beautiful bird (and tick it off my New York State checklist). And I would invite my nieces along (at least, the two that are old enough to hold binoculars up). Unfortunately, Raven had basketball practice but her older sister Jessica was more than willing to accompany me on my avian adventure. We got to Phoenicia at about ten to one in the afternoon and quickly realized that finding the oriole would not be an easy task. Tremper Road is only one block long but it seemed like every house had a feeder! Pigeons and starlings cooed and whistled while Blue Jays screamed and American Goldfinches called “potato chip, potato chip” as they flew overhead. We spotted a couple of binocular-toting birders (ah, the field-glass fraternity) who told us they had already seen the oriole and it was last seen flying through backyards towards the east with a flock of chickadees as escorts. We despaired but kept searching despite the cold wind that picked up out of nowhere and the flurries that started to fall. We watched it feed for a full five minutes until it flew off and then we went home. Nice blog, I have linked to it. Write lots, I will visit regularly. Well thank you very much Jochen…I’ve lurked on your blog pretty much since you started it and will be reciprocating the link. Lucky me! I live on Tremper Avenue, Phoenicia. It’s not often we have a celebrity in our midst. Be assured we are taking good care of him. No potato chips for our birds. Demokitty, lucky you indeed! I hope that we birders haven’t been too much of a nuisance. And thanks to you and your neighbors for being so helpful to folks hoping to see the beautiful oriole. I happened on the oriole and several of its admirers purely by chance this past Tuesday.I live in a nearby town and am frequently in Phoenicia. Some kind gentlemen from Long Island pointed out the bird to me and let me view it through their finding scopes. What a beautiful little creature! I only hope he survives this nor’easter in a sheltered spot on Tremper Ave.! He’s still going strong…seen again today according to a report on the NYS Listserv. Where Are You Birding This Last Weekend of October 2009?